Refreshing and easy spiralized cucumber salad. 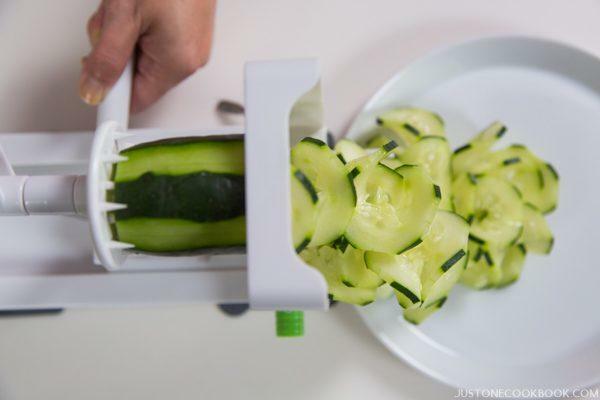 Impress your friends and family by slicing vegetables into cool shapes with the spiralizer. 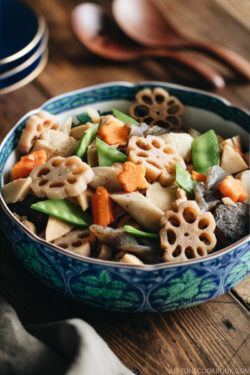 As the weather is getting warmer and summer is just around the corner, I love making refreshing salad and side dishes to go with our Japanese meals. 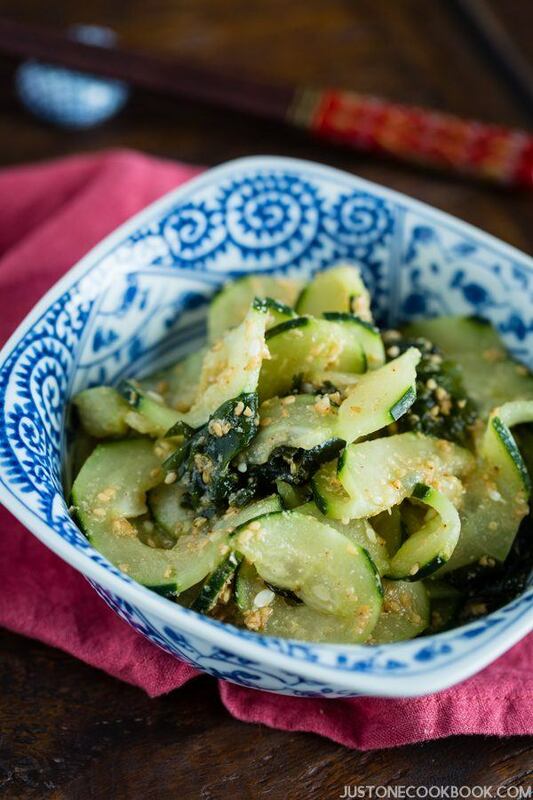 Today I’m sharing my Spiralized Cucumber Salad with Sesame Dressing. This sesame vinaigrette is called gomazu-ae (胡麻酢和え) in Japanese. 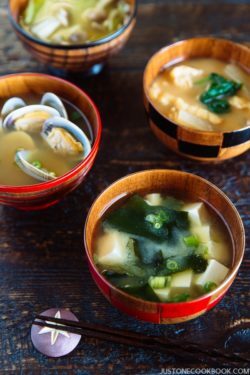 You might be more familiar with Spinach Goma-ae (ほうれん草の胡麻和え) as it’s a better-known dish in the U.S. (how about where you live?). Compared to Goma-ae, this sesame vinaigrette is more refreshing and I love the addition of nutty aromatic sesame seeds. 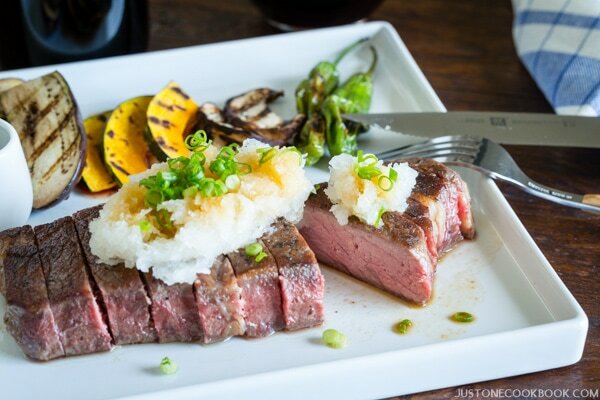 This dish is super easy and you can make it in less than 15 minutes. I received The Inspiralizer from Ali from Inspiralized.com several weeks ago, and I’ve been busy spiralizing vegetables and fruits ever since!! I still enjoy regular noodles and pasta, but zucchini noodles or zoodles are one of the popular ways to make a dish into a “light” meal and I love the concept! 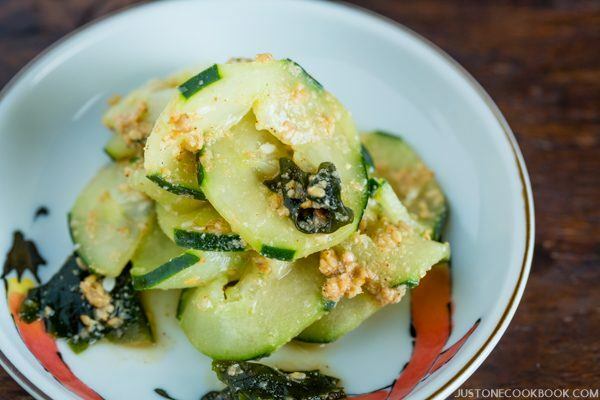 You can make Japanese Cucumber Salad by simply slicing cucumbers, but spiralized cucumbers are more fun! They give more dimensions to the salad and I love how it gives textures when you eat. The spiralizer could also make food more fun for the family. My daughter loves apples and lately her new routine after dinner is spiralizing an apple and eat with sprinkle of cinnamon. As I’m turning 40 later this year, I’ve been inspired to eat clean and healthy whenever I can. I said “whenever I can” because sometimes I do enjoy a fatty meal with friends and family and treat myself. I consider it’s okay as long as it’s occasional. As I regularly try out different foods and test recipes all the time, I don’t want to restrict my diet to just salads and vegetables or avoid certain foods. I just try my best to eat healthy, whole foods – food that has been processed/refined as little as possible and is free from additives or other artificial substances. A few months ago, I discovered this great YouTube fitness channel called FitnessBlender.com (YouTube | Website). I’ve been watching their YouTube channel to exercise in my living room every day for the past month and I am feeling great! I want to keep my body strong and healthy (and it’s a bonus if I could shed some weight during the process!!). Cover and soak 1 Tbsp. wakame in water until it softens and hydrates, about 5 minutes. Grind 3 Tbsp. toasted white sesame seeds in pestle and mortar (Japanese style is wooden pestle and grooved mortar), keeping some seeds unground for some texture. Add 2 tsp. sugar, 1 Tbsp. soy sauce, and 3 Tbsp. 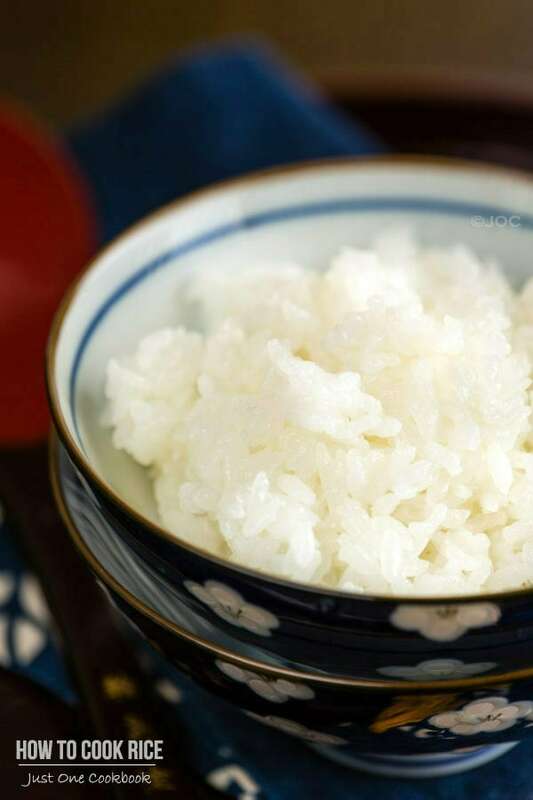 rice vinegar and mix well. Set aside. I usually like to make a striped pattern by alternately peeling a ½-inch-wide strip lengthwise, then leaving a strip of the skin intact. 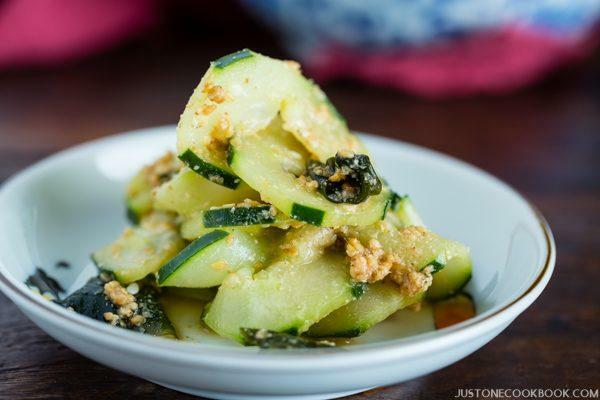 With this method, the cucumber slices have some decorative dark green accents and a little bit of extra crunchiness. Center align the cucumber on the spiralizer and press firmly to secure both ends (For The Inspiralizer, set to "Blade A" for wide ribbons). 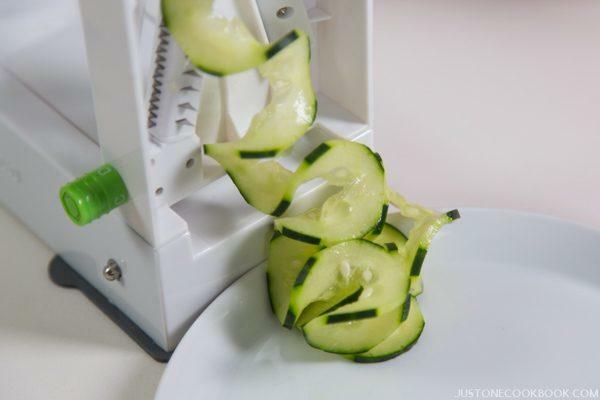 If you don’t use a spiralizer, simply slice the cucumber into thin slices. Spin the handle clockwise to spiralize. Using a kitchen shears or knife, cut the spiralized cucumber into shorter lengths. Sprinkle kosher salt and give some gentle massage. Set aside for a few minutes. Squeeze the excess moisture out and place in a bowl. Squeeze wakame and add to the bowl. 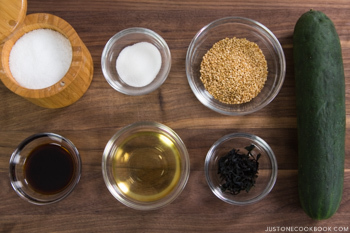 Before serving, Pour the sesame dressing over the cucumber and wakame, and mix well together. Serve in individual dishes or in a large serving bowl. Serve immediately. I don’t recommend keeping it for a long time as moisture from the cucumber will dilute the dressing and the salad becomes more like pickles. If that’s okay, it will last in the fridge for 2-3 days. It looks like a Japanese cucumber. 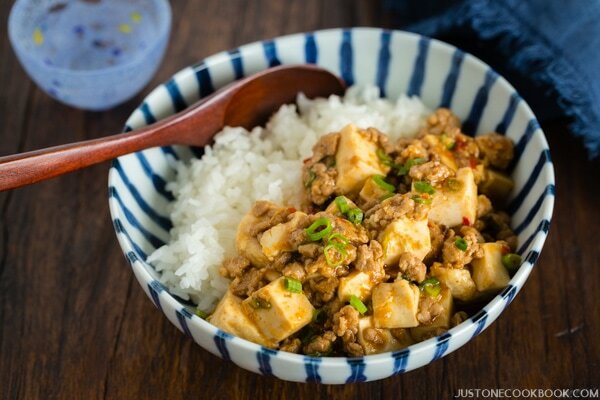 Glad to see this healthy dish and it sounds simple to make too. Hope you enjoy eating healthy foods and post a lot of healthy dishes. Hi Nami! I own a spiralizer and I’ve made zoodles (zucchini noodles) to replace pasta. Now I have to try a different blade and make this refreshing salad! I love cucumbers! And I’ve been following Fitness Blender too! Kelli and Daniel are so motivating and make you feel like you can do anything! Here’s to your good health! Hi Donna! So happy to hear you make zoodles and work out with FitnessBlender too! I’m doing 8 weeks (45-1 hour one), and it’s been pretty good so far (I’m dying everyday). Now I know I got a workout buddy! It will help me inspired! Thank you! I’ve been contemplating a spiralizer purchase for months now. Is it easy to use? I don’t want or need another kitchen gadget taking up space in the cupboards. Your salad looks delicious. I’m going try that soon. I’m also going to try the fitness Chanel. Hi Monica! I thought of purchasing it for some time too (then I received it as a gift). I’m glad I got one. I’ve been in this “healthy” mode so I use it more than I would if I purchased let’s say last year when I wasn’t that much into keeping healthy. So it’s really up to the user. Thank you for the cucumber recipe. It looks delicious! I have been trying to become more fit also. Have you tried http://www.myfitnesspal.com? It really helps me stay on track. I’ve been entering my meals into MFP for the past year, and have it set so it records my steps taken with the iPhone. I have lost almost 60 pounds this past year. It’s a wonderful free program. Hi June! That is awesome!! Congratulations on losing 60 lbs! I wish it was me! 😀 I’ll try recording my meals again… Thank you for sharing your success story with us! Hi Tamala! Thank you! I’m happy to hear you’re working towards healthy lifestyle too! I used to use MyFitnessPal, but I stopped using…. I just couldn’t keep up recording what I ate…. and it was hard to enter what I ate (Japanese food)…. I’ll give it a try again! This sounds delicious! Will get the seaweed so I can make it tonight! Thank you! You really do have to exercise more as you get older just to stay kinda sorta in shape. Good for you for finding something you like doing and that works well with your schedule! And good for you for sharing this wonderful salad with us! Love the dressing — thanks. In Australia almost every on-line shop is giving away small simple spiralizers as an ‘extra’ – not particularly strong they do work fine with zucchini etc . . . . have a drawerful!!! Have not tried cucumber for some reason but will soonest: what fun 🙂 ! Like the dressing: am so used to the Scandinavian ways there since childhood – it will be a lovely change doing it Japanese!! OH: was not able to comment on the last blog – your programme became unresponsive a number of times half way and I just gave up: perhaps too long a post with comments going back to 2013 methinks? Just so you know 🙂 ! 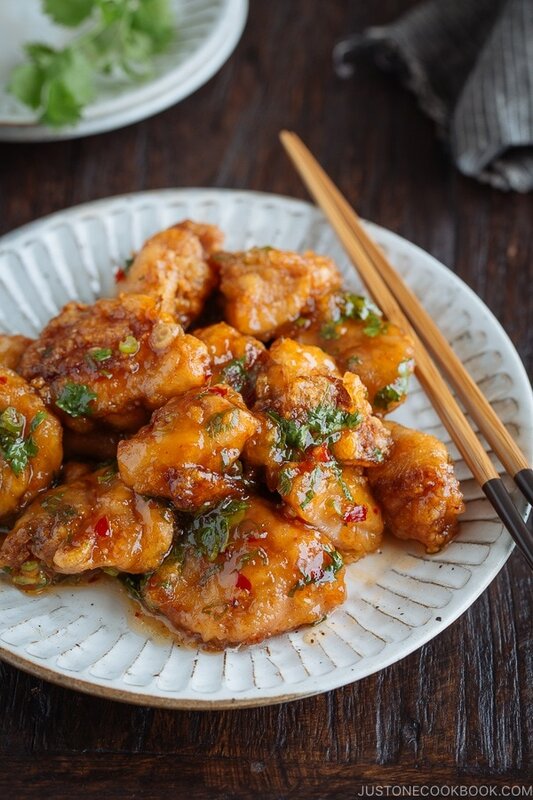 Simple and delicious, always my favorite kind of recipe! Dear Nami, should I sprinkle sesame on the top or add it to the dressing? I think this bit is missing in the recipe? Hi Sapola! I am so sorry for my late response. Do you mean by 3 Tbsp. sesame seeds? It’s in Step 2 when you need to grind and then make into sauce. Or do you see any mistake somewhere in the recipe? 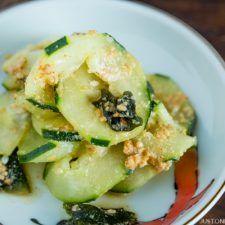 I love cucumber salads and sesame dressings so I can’t wait to try this recipe one of these days! It looks absolutely delicious and perfect for the warm weather indeed. You work out every day, I am impressed! I do about 3 workouts a week and I love the results I am seeing. Feeling stronger and healthier is a wonderful thing! Hi Olivia! I apologize for my late response. I hope you enjoy this salad. Quite refreshing with the rice vinegar inside. I’m so happy to hear you follow FB as well! I do, I follow their 8 week program, and this past week was the first week that I couldn’t do the workout as I was extremely busy. I usually drop off my kids at school and come home to do the workout so I don’t have excuses. I’m not losing a lot of weight, but I think I’m more toned than before. I just purchased 30 min program so that I can (hopefully) continue while I’m in Japan. Eating is part of my job so I have to somehow balance out… 😀 Thank you so much for writing! Tomorrow I have their 1000 calorie workout waiting in my workout calender and I’m scaaareddddd!!! lol. Hi Olivia! No, I’m so glad you shared your story about FB! I’ve been telling my friends (and look, even my readers LOL!!! ), so I definitely share the excitement with you. I used to have a trainer when I went to Mr. JOC’s previous company’s gym and that time I learned that weights really helped and I was quite surprised how toned I became. So I’m a fan of lifting weights. I have been debating about Powerblocks, but I have bouncing ball and elastic ropes that I bought but never used… and Mr. JOC will kill me if Powerblocks is sitting around… so I’ll wait for another year to see if I can show my determination. Haha. If you do FB programs, how do you schedule 3 times a week? You schedule your own? I picked 8 weeks, and my calendar automatically fill up with their program. I missed last week, so my calendar now messed up and I have to go to May to do today’s workout. I wish I can “edit” the scheduled workout…. Thanks so much for your response, Olivia! Gahahaha! I guess it’s not just me with unused elastic ropes (I actually brought them to Japan last summer, NEVER used, and brought them back. SIGH!). Thanks for sharing your tip! I see, so it is impossible to edit the workout. Too bad. It’s great that you can make your own schedule. I’m not there yet. I still need someone to tell me what workout needs to be done. Maybe one day I can make my workout routine that works for me. Yes… that’s exactly I’m afraid now. Japan is hot, someone lives underneath my condo (hard to jump), and kids are with me 24/7. These reasons are enough to de-motivate me and I can’t edit my workout schedule… 2 months no workout will put me back to ZERO (or negative!)…. yikes. I am glad to have found a FB workout buddy too! I think it gives extra motivation to share those things! BTW, I forgot to tell you that I made this cucumber salad the other day (to eat with omurice) and it was absolutely delicious! No surprise there though..all the recipes I have tried from your site have been amazing! I LOOOOVE Yosemite, especially High Sierra (and esp. Tuolumne Meadows)… Hope you get to visit Yosemite again too! I don’t have a spiralizer, but I can slice a cucumber really thin. Love this salad!!! I’m very happy that you have a just one cook book because I really love cooking and Thank you for all the delicious recipe that you always post. Hi Melinda! I’m so happy to hear you like my recipes! Thank you for your kind feedback! This is the best salad I’ve ever tasted, and the sesame dressing is amazing. 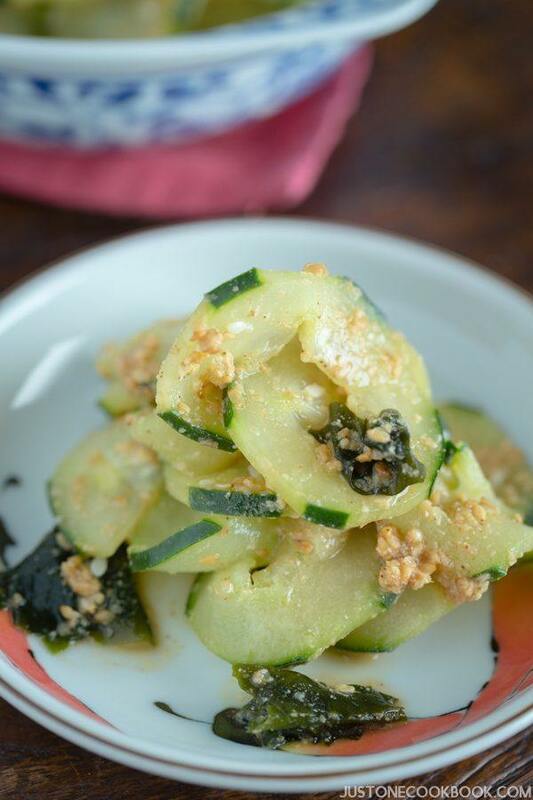 Great idea to combine the cucumber with vinegar and soy sauce, we usually use sour cream. I love Your recipes. Greetings from Poland. I just made this today for my husband and I and it was really easy and tasty! Thanks!